Plow Technologies can automate and enable remote control of your plunger lift system through its OnPing hosted SCADA and HMI system. With OnPing plunger lift control you can have access to regular reports of plunger status and operating times from any internet enabled device in any location. Perhaps the greatest advantage of this software-based plunger control solution is that in most cases it can be integrated in to your Plow Technologies PLC with only minimal additional hardware. 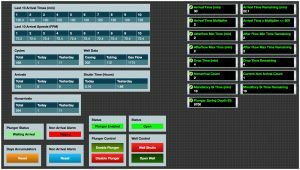 It is even possible to centralize control of multiple plungers on a site or even on multiple sites in to one online dashboard HMI for quick access and rapid assessment. Set arrival times, afterflow minimum times, afterflow maximum times, mandatory shutin times and other parameters for custom alarming and automated functions. This cloud hosted control and automation solution means considerable savings on costly hardware controllers and less time spent on site adjusting times and settings. Custom set-points and alarms mean the system can respond quickly to any errors or failures in equipment preventing costly accidents or damage.